Our cooking thermometers, refrigerator thermometers, and kitchen timers keep your kitchen functioning safely and efficiently. 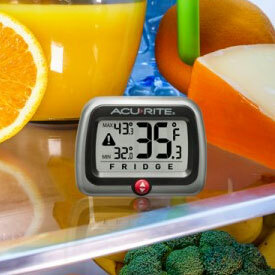 Accurate digital refrigerator thermometers help to store food at the ideal temperature, while other devices like meat thermometers and oven thermometers keep you prepared to cook any dish. Shop all cooking and kitchen devices from AcuRite’s online selection, ideal for cooking in the kitchen, grilling outside or even to bring on a camping trip. We offer a wide variety of analog thermometers and digital thermometers, including meat thermometers, candy thermometers, refrigerator thermometers, oven thermometers and more. Keep your refrigerator and freezer at the perfect temperature for food storage with one of our easy to mount freezer / refrigerator thermometers, or opt for our high-tech digital refrigerator and freezer thermometer with alerts and high/low records for ultimate efficiency. Preset your minimum and maximum temperatures, then let the thermometer alarm notify when the temperature is off. 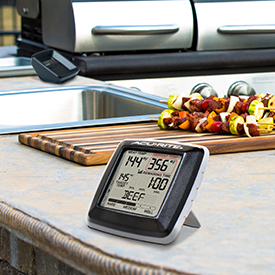 Prepare a delicious family meal with our digital meat thermometer, which includes a kitchen timer and wireless pager with a 200-ft. radius. Take your chef skills to the next level using our candy and deep fry thermometer combination to cook dinner and dessert with ease. Whether you are baking, broiling, warming or roast, a durable stainless steel oven thermometer is the key to measuring specific foods or specific locations (oven racks) inside your oven. Plus, browse our turn knob and digital kitchen timers, and other home monitoring devices perfect for keeping your kitchen safe and functional. 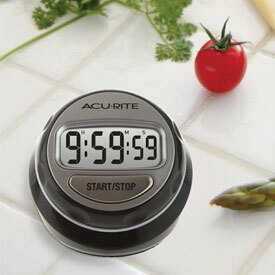 Our Stainless Steel Rotary Digital Timer can be easily set with one hand using the twist dial and stays firmly in place on your countertop with a firm grip base – ideal for when you have your hands full in the kitchen. Go beyond the kitchen with our Non-Contact Infrared Thermometer, which can accurately measure the temperature under the hood of your car, your HVAC system, or a drafty basement window—perfect for quick temperature readings at home or on-the-go! AcuRite provides you with the leading weather stations and home monitoring devices to ensure your home is equipped with the home technology it needs to run efficiently inside and outdoors. Shop our weather stations for everything from basic weather stations to high-tech 5-in-1 weather stations, and supplement your home monitoring environment with other devices such as hygrometers, rain gauges, lightning detectors, weather alert radios, thermometers, and more. Not looking for a weather station? We also specialize in indoor clocks and outdoor clocks, kitchen devices, gardening tools such a soil meters, and other home monitoring technology. Browse our wide range of home technology products or shop our weekly deals to find the perfect device for your smart home.